Cupcakes 'n Daisies: I'm Back, Again . . And so are these!! I'm Back, Again . . And so are these!! The coconut m&m's are back at my store, for a limited time only. Be on the lookout for them in your store, they are by far my favorite m&m and they don't hang around long. The lack of blogging is due to one week spent with my folks and one week spent with my daughter. Last week I met my baby girl for a week of fun in Las Vegas. One week each year we meet for a Mother/Daughter vacation. It's one of my favorite weeks of the year. We laugh, relax, and get caught up on on the happenings in our lives. This year we struggled with our destination, but finally decided on Las Vegas. It was a good choice. and laughed all week long. (until we got the airport, then I cried). The week just flew by. I won't see my baby girl again until Thanksgiving. I had the best time and am already counting the days until our trip next year. While I was busy with family, you were busy trying to help me finish up A la Mode. Thanks so much for all your help! I received 40 comments!! Give yourselves a pat on the back, you're a clever group! Here's where I'm at right now. Someone suggested that I finish the lattice border before making up my mind about the containment border, because having the entire border surrounding the baskets will change how it all looks. I could not agree more, so first up, I'm finishing the top row. I'm NOT going to separate the basket blocks and add something. Someone suggested adding the lattice border in between , which I loved, but they would have to be smaller in size and I think two different sizes of lattice blocks would be too busy. I'm not going with any of the fabric that I initially auditioned. The brown was a very popular choice, most popular in fact, but I thought it was too big of a contrast and a distraction. And finally, I'm not going with a narrower lattice block to fit. I would need to cut 3/4 an inch off the inner side, and I think that would give it a wonky, unfinished look. Using a containment border that's a tone on tone, light pink (thanks Sinta! ), or custard or peach (thanks Carrie!). Using a containment border that's all the colors listed above, set between blocks of my background fabric. Not only was Jane clever enough to come up with this idea, she was able to photoshop my picture to illustrate her suggestion! You know me and my mind's eye, in this case, a picture was worth a thousand words! It's just a matter of finding the perfect tonal values of fabric. then I plan to remove the current sashing, and add new sashing that is the proper width to "push" the baskets into the lattice border. If I had had the foresight to pick this border when I started this project, this is what this project would have looked like, so I'm not going to throw this idea away just because it's labor intensive. So stay tuned, it's like my very own summer soap opera....except this is going to have a happy ending!! I guarantee it!! 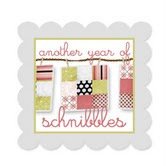 Tomorrow is my one year anniversary for my blog! 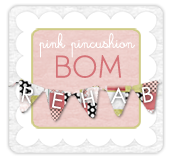 Stop back by, I have some giveaways and posts planned for each day the rest of the week. Now I'm off to see what you've been doing these past two weeks!! It looks like you had a great time with your daughter! Whatever you decide to do with this quilt will be gorgeous! What a great time with your daughter! I am sure you will make the most of your time at Thanksgiving too. It really isn't that far away. As for your quilt, you really did get tons of suggestions, all good. I am looking forward to seeing the final result! You're back! How wonderful that your blog 'vacation' was spent with those you love. I haven't seen my parents for a year. They usually visit at some point in the year but could not make it this year so times a ticking and I hope I can get to them at some point. My daughter just moved cross country last week so your idea of a yearly vacation sounds wonderful! I'll get to see my baby next month when I fly up to NH to go Wedding dress shopping. I can't wait, so I can really sympathize. I'm looking forward to seeing how A la Mode turns out. It seems to have taken a life of it's own and is guiding itself to finish. 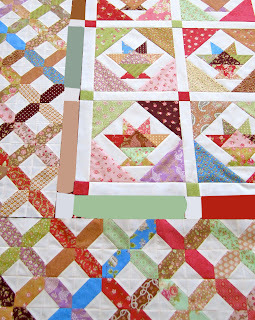 Hi Thelma..love the way the quilt is looking..cant wait to see the finished result..! Dont you just love spending time with your daughter, I do...I fly to Melbourne every couple of months to catch up with rissa..but we might start doing what you guys do and make it a week instead of all these busy short stays..sounds grand! Glad you had a great time.. I love the way that border looks with the basket blocks and I couldn't agree more that it is worth it to find what makes the quilt "right" for you, even if it is labor intensive. I once saw an interview with Jinny Beyer where she decided not to change something she didn't like in a quilt and now that's all she sees when she looks at it. I am a believer in making quilts you love instead of just cranking them out. (I'm kind of a slow quilter, so that's my story and I'm sticking to it!) I can't wait to see A la Mode finished. What a wonderful treat to spend time with your daughter! Treasured moments for sure. 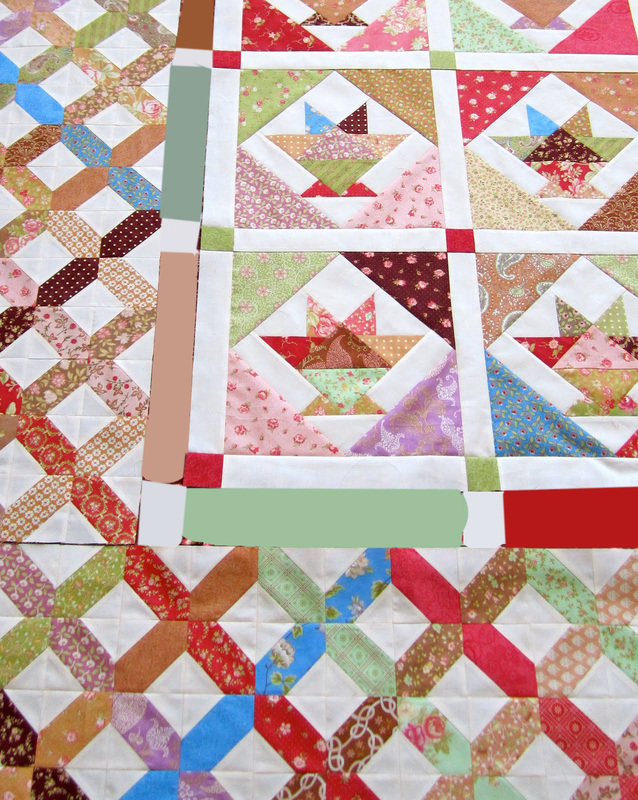 Love your new ideas for the soap opera basket quilt layout! Holy crap but I am gobsmacked by what you have done with this quilt!! It's just amazing...I love it! No valuable suggestions here but I know I'm going to like whatever you do for the final border choices :). Cupcakes in Vegas! I'm sure you did us proud! LOL! i wondered where you had disappeared to. We were on holidays too. this quilt is amazing. then again all your quilts are mouth watering! looking forward to your next blogs! Whew! So glad you're back! I really like the photoshopped solution.... I would not have thought of that! Your daughter is adorable and you both look like you were having the time of your lives. I need to implement this tradition with my daughter immediately. You sure did get some brilliant suggestions for your containment border. Woo Hoo! That is going to be SOME quilt. What cute, cute pictures of you and your daughter. Sounds like a very fun tradition! OMG, coconut M&Ms - those are so yummy! I didn't realize they were a "limited edition" thing - must go and find some! I've not heard of those M & M's, but will look for them:) Wonderful that you are able to spend extended time with your daughter. Just got a call from our son at college. He's coming home this weekend to work. Yahoo! We'll get to see him. He's only been gone a week:) Take care! Grace is Back in the House . . . . .
Another Winner . . . . It's a Wrap . . . .
A Few of My Favorites . . . The Celebration Continues . . . . .
1 Year Down, ?? To Go . . . . .
A la Mode - Update . . . . .
August and Dot Updates . . . . .